Zelda II: The Adventure of Link is the direct sequel to The Legend of Zelda and differs heavily from all other titles of the Zelda series. 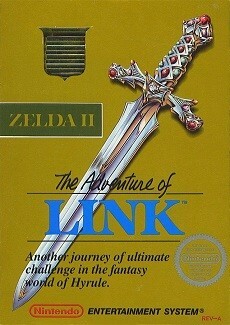 In order not to produce a direct copy of the first part, Nintendo introduced several novelties to the game's system, most noticeable is probably the side view perspective. There were other changes that give the game more roleplaying depth, such as the XP-system or the world map with cities and dungeons - elements that many people rather connect to Dragon Quest or Final Fantasy. Actually, Zelda II is not a bad game, but many consider it the black sheep of the series due to the different gameplay and the incredible difficulty. The guys at Nintendo seem to think better of the game, thus they rereleasyed the game 2003 and 2004 for the GameCube and the Gameboy Advance - and a while later also for the Wii's Virtual Console. However, the rereleases did not remain unaltered: a short sequence was altered which includes flashing lights that in the worst case might lead to epileptic fits for people with photosensitivity. The scene is similar to the infamous Pokemon episode "Dennō Senshi Porigon" which - during its only broadcast - affected 600 Japanese children. 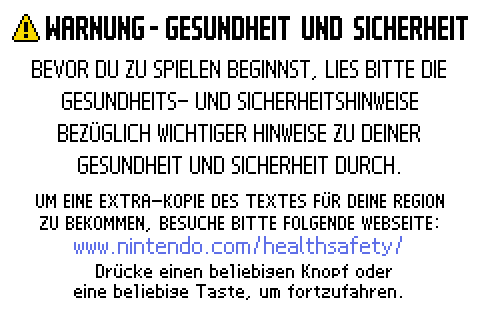 Today, many games for the Game Boy Advance include a starting Screen that refers to a link on Nintendo's Website which addresses both epilepsy and exhaustion from gaming. This is a comparison between the Original NES Version and the edited GameCube and Game Boy Advance rereleases. NOTE: It is possible that the flashing on the small handheld display appears less intense and thus the alteration not really sensible. However, Game Boy Advance games can played on the GameCube with an adapter and 10 years ago the television sets had cathode ray tubes which themselves already flicker quite a bit. If Link dies in the NES Version, the entire background flashes for half a second and extremely quickly in the colors red, blue, red, and green. The flashing was toned down on the GameCube by solely using red and deep red. On the Game Boy Advance the flahsing was toned down even further. You see the colors red and bright red which change much slower.